We have several Aussies, take a look. We’ve had a few litters, check them out. Our Aussies are raised in our living room, following a protocol that will help them blend into their new home with confidence. Our Aussies go everywhere with us, they go to dog shows and they kayak too. 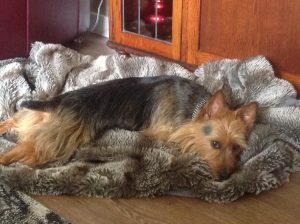 We often describe the Australian terrier or “Aussie” as a ‘Big dog in a small package”. They are spirited, self confident, energetic and loyal, with an even disposition that makes them suitable as a companion dog. 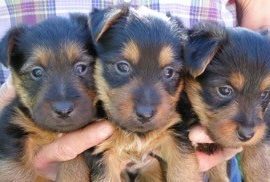 They were bred to be a working terrier and as such they require patience and a positive approach from its new owner to help your Aussie develop into the best loving companion that they can be. 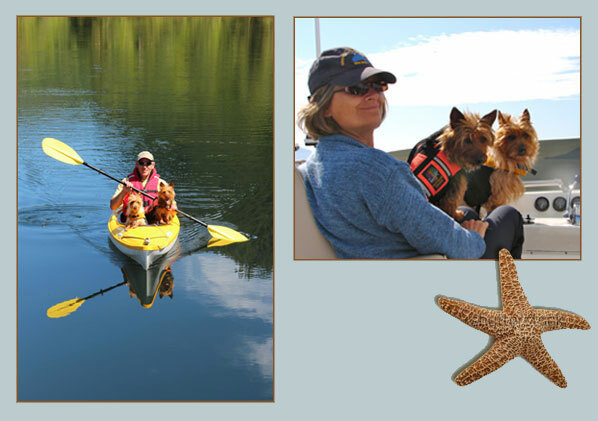 An Aussie has stamina and is tough enough to participate in hiking, walking, agility, obedience, barn hunt, lure coursing and chasability, and other activities that we like such as kayaking, boating and paddle boarding (all with a life jacket as they are not naturally swimmers). They are endlessly entertaining and bring joy into any household. Are mischievous and loving, alert and curious, self-confident and intelligent. You will find they want to be with you or near you. They are NOT a dog you can leave on a chain or in the back yard alone. To train this little dog, one needs to make it fun, and provide routine and consistnecy to your training. They often may look at you as if to say"This isn’t fun! Lets do something else” By keeping the games (training) fun and rewarding you will find they are quick learners and love to please, themselves and you. 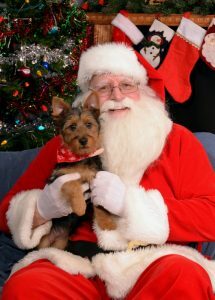 When living with an Australian terrier you will find a loving companion who will bring you great joy! Australian Terriers have been a big part of our lives for over 20 years. Rhapsody, a.k.a. ”Ratdog”, joined our family in 1995, after a nine-month hunt for just the right breed. An Aussie’s characteristic awareness, independence, playful personality, courage, exuberance and devotion struck a cord with us. Once we experienced their desire to curl up with us on the couch or our lap, we were smitten for life. 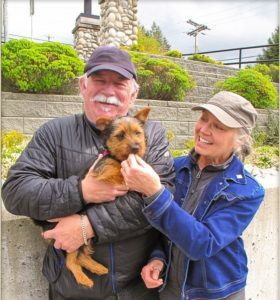 Our Aussie’s bring "Joy" into our lives and fit easily into our lifestyle whether we are hanging out at home, walking, hiking, travelling - by car, air or cruising the coast of British Columbia. Our Aussie has brought a special light to our lives. Easily socialized, she is always ready to go anywhere or just hang out with us at home. She is crazy about other dogs loving nothing better than to get together with one of her canine friends for a game of chase or tug. Aptly named Cozy she can be counted on to enjoy the softer comforts of life. Her breeders, Caren and Alan, are very particular about the homes their pups go to so I guess we were lucky to have been chosen. They are excellent about keeping in touch and I know they can be counted on in a pinch with just the right solution if one is needed. They offer continued support and have been a good resource of ideas and friendship too. We were so fortunate to meet Caren, Alan and Tidewalker just after Kanti had given birth to her first litter. 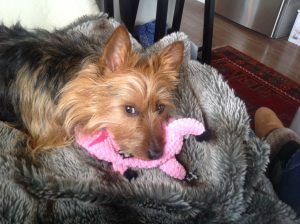 We had just moved to Vancouver Island from Hong Kong and were looking for a new dog to join our family. Maggie is everything we could have hoped for. Beautiful both in looks and nature, more character than any dog either of us had ever met, an amazing companion and truly loving. She has shared a house with two small children since they were four and shown amazing patience! She has settled well in her new home in Chicago though we miss the "family" get togethers on the island. 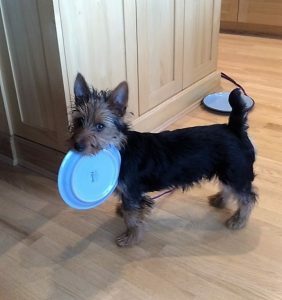 We would highly recommend both Australian Terriers as a breed and Tidewalker as a breeder - we would love another of their puppies to join Maggie now! We welcomed Sidney into our home on Halloween day 2016 and our love affair with this breed began! Anticipating Glory’s first litter for over a year we were not disappointed. She is a loving, spirited Aussie that brings joy to our hearts and a smile to our faces every day. We can’t imagine life without her. Along with welcoming Sidney, a bonus has been the friendship we have cultivated with Caren & Alan. We can’t say enough about their dedication to this breed and their desire to ensure the Australian Terrier lives on for many decades to come. 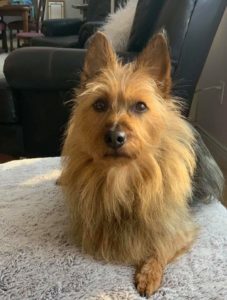 We count on their knowledge and experiences with these little terriers and we know we can always call if we have a question or just want to recount a funny story about our furry family member. We are proud to be a part of the growing Tidewalker family. 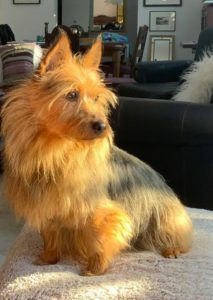 Ross & I have an Australian Terrier, Tori, from Tidewalker. This is our 3rd Aussie from different breeders. and dogs of all sizes. When we are out with her, people stop, smile and comment on how playful she is. Prior to getting Tori, they wanted to meet us as we wanted to meet them to see who they were and how they operated. We were both pleased and impressed with the level of detail and love that they brought to the breed - Tori is a result of that. “In 2017, we were interested in a new puppy after the passing of both our dogs. 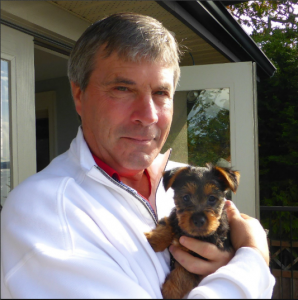 After extensive research we settled on the Australian Terrier as our breed of choice. Our research led us to the Tidewalker website and the beginning of a relationship and now friendship with breeders Caren and Alan. As a previous owner of a champion Brittany, we understood the impact a good breeder would have on how a puppy was socialized and supported in future years. As potential owners of a Tidewalker puppy we were invited to Caren and Alan’s home to play with the puppies. We appreciated instantly that Caren and Alan spent a great deal of time socializing and preparing these puppies for the big wide world. They had extensive handling routines and exposed the puppies to a variety of experiences. Their entire home was given over to the litter and the puppies were members of the family exposed to all the daily sounds, smells and activities of a busy household. Caren and Alan spent a great deal of time with us sharing their knowledge about the breed, watching how we interacted with the puppies, and answering our questions. 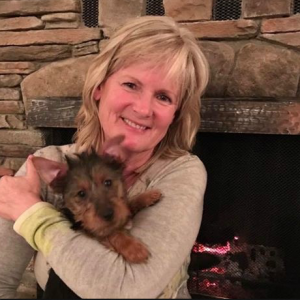 The most telling demonstration of their dedication and care as breeders was the fact that the decision as to which puppy we would take home would belong to Caren and Alan. After watching us interact with their puppies they matched the temperament of the puppy to us as owners and also to environment the puppy would call home. Dulcie (“Tidewalker Sweet Daylight”) came home with us at 11 weeks and we have had nonstop support from Caren and Alan. We have had several dogs in our lives and we have to say that Dulcie is the most amazing, well-adjusted and “bombproof” dog we have ever owned. If Australian Terriers are a breed you are considering, we can absolutely recommend Tidewalker as the epitome of “the best of breeders”.